Although OpenOffice.org is a competent productivity suite, you can add some nifty features to it using extensions. There are hundreds of nifty extensions available in the official extension repository. Some of them add a feature or two, while others take OpenOffice.org to a whole new level. The AuthorSupportTool (AST) extension belongs to the latter category. AST not just adds some random features to OpenOffice.org Writer, it dramatically enhances the word processor’s functionality, turning it into a powerful tool for working on research papers and complex documents. Since AST is a standard OpenOffice.org extension, installing it is easy. Grab the latest .oxt package, launch OpenOffice.org, choose Tools -> Extension Manager, press Add, select the downloaded extension, and press Open. Restart OpenOffice.org and you are done. Once installed, AST adds a separate AuthorSupportTool menu which gives you quick access to all the extension’s features. So let’s take a look at the most interesting tools on offer. The first item on the menu is Template Wizard. As the name suggests, this feature lets you create a template for your documents in a few simple steps. 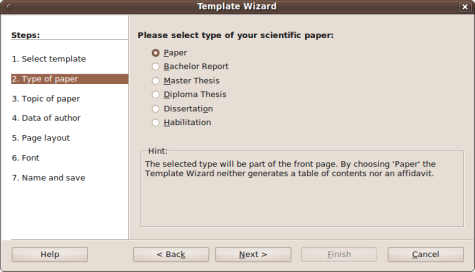 Using the wizard, you can specify a template type (e.g., Paper, Bachelor Report, Master Thesis, etc), topic (e.g., Title, Subtitle, and Keywords), author data, page layout, and fonts. AST comes with its own bibliographical and reference tool which can come in handy when you work on a research paper or another project that requires this type of functionality. 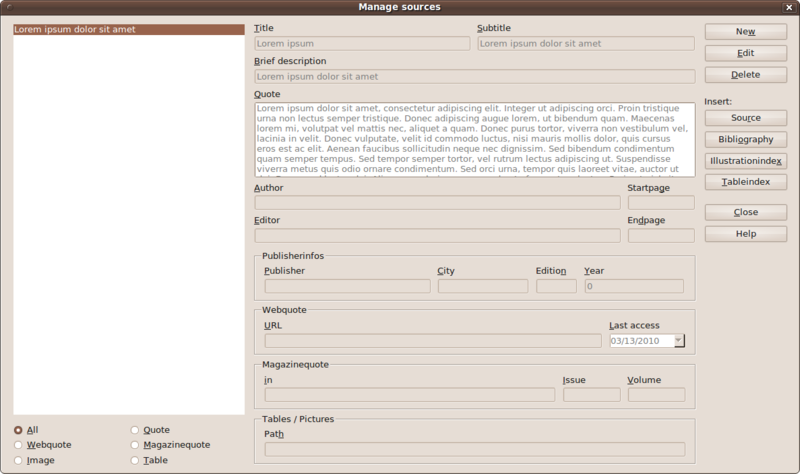 The Sources menu item contains two commands: Manage reference styles and Manage sources. The former opens the reference style editor which you can use to specify desired reference styles. The Manage sources command gives you access to the sources editor which you can use to enter and manage quotes, images, and tables. The sources editor also lets you easily insert any of the stored items into the current document as well as generate a bibliography and indexes. The Focal Points editor is another useful tool, and you can access it via the Manage focal points command. You can think of the focal points editor as a graphical non-hierarchical outliner which you can use to manage the document structure as a flowchart. The clever part here is that once the flowchart is ready, you can convert it into the traditional document structure where each node (or focal point in AST’s terminology) becomes a document heading. To do this, press the Generate button, and AST converts the flowchart and inserts the resulting headings into the current document. Keeping track of your progress is crucial when working on complex projects, and AST sports a rather clever Work progress feature that allows you to do just that. This tool provides a visual timeline as well as essential info about the current document, including word and page count, number of illustrations and tables, and so on. Here you can also specify the duration of the project and set milestones. Finally, AST sports a simple backup tool. Choose the Save as backup command, and AST saves the current version of the document in the document directory. You can then use the Restore backup command to revert the document to any of the saved versions of the document. Obviously, not all OpenOffice.org Writer users need the functionality offered by the AuthorSupportTool extension. However, if you use Writer as your word processor of choice for writing papers and work on complex projects, AuthorSupportTool can prove to be an indispensable tool in your arsenal. This entry was posted in Open Source, OpenOffice.org and tagged OpenOffice.org on March 15, 2010 by wlmanager. It seems to me that most of that could be accomplished more efficiently by writing those papers with LaTeX. Then again, I suppose students are forced to submit papers as .doc files, or some such nonsense. Of course, LaTeX can be exported to odt rather simply. Convert the tex file to pdf then import it with the Sun plugin here http://extensions.services.openoffice.org/en/project/pdfimport is one way. There are others. I have Open Office 3.1 on my pc and I typed a letter this am and I saved it..I tried to go back in the letter and it comes up but it is frozen…it won’t move either way and I can’t even shut it down! Please help. 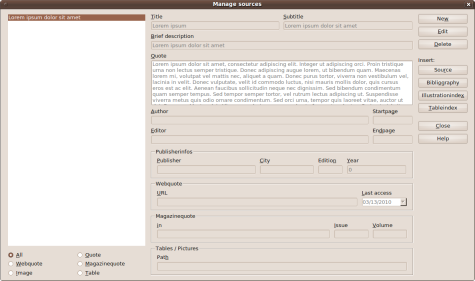 AST appeared to be a great application but I haven’t been able to insert sources to my document. Having created a few sources as well as reference styles I choose a source in the left area, press Source, choose a style and confirm with OK but no source is inserted into the text. Nothing happens! Does anyone have any idea on what might have gone wrong? Is it something I haven’t done or is there a problem with my software?